The youngsters are coming of age quickly, and it can’t come soon enough for Shefield Eagles as they plot a course away from the drop zone. 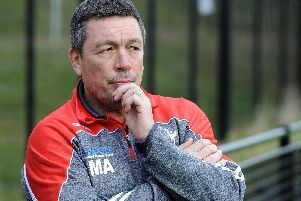 Director Mark Aston has hailed the impact of new recruit Max Garcia, a player he’d have liked to have worked with more behind the scenes before thrusting him into the muck and bullets of Championship RL. But Aston has turned to the young Frenchman in his last two outings and not been disappointed. “I was over the moon for Max after his performance against Rochdale” Aston explained. Ryan Millar’s switch from full-back to wing hs caught the eye too, whilst dual-registration ace Matty Costello has taken on the challenge of filling the full-back role. “We have seen some good things from Ryan,” he added. With a disappointing second-half their undoing in the Bank Holiday Monday defeat to Batley, Aston knows a performance similar to the one that dispatched Rochdale will be key if they are to see off fellow strugglers Swinton on Sunday (4.30pm). “We gave away a game as I thought we were in control of the first 40 minutes,” he continued. “The last three games we have been in control. There is progression but we have got to be better.